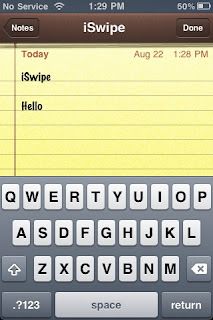 Recently, I found a free tweak on Cydia called iSwipe. It's like the Swype keyboard on Android for your iDevice. If you don't know what a Swype keyboard is, it's basically a way to type words and sentences by using your finger to swipe the words on the keyboard. You just connect the letters to spell out the word. The tweak automatically puts the word in for you. 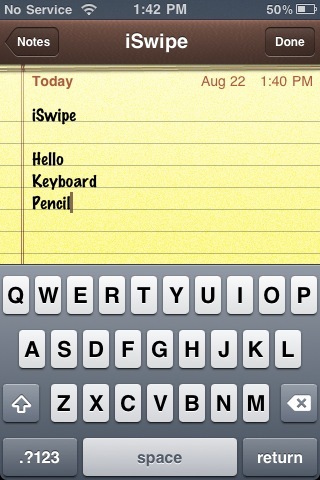 As you can see in the picture, I swipe over the letters I want to use and a blue line appears where I swiped. Then it automatically puts the word "hello" in. This also works with longer words such as "keyboard"
Also, if you swipe a word and it doesn't get it right, there are suggestions too. In the below picture I was trying to swipe the word "pencil" but it spelled "prechill" By tapping on the suggestion, it changes to "pencil"
With this alternative way of typing, it should be faster (theoretically) because you don't have to type in each letter. Now that you know what it does, here is how to get it on your iDevice. 3. Add this source "http://repo.insanelyi.com/"
4. Go to Search and search "iSwipe"
5. Install, restart springboard, and get ready to use iSwipe. For double letters like in the word "Hello" do an extra swirl around the letter that needs to be doubled. 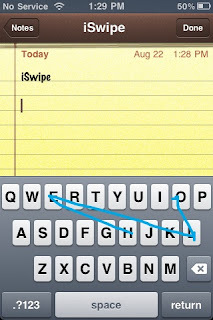 For longer words (8 letters + ) swipe a little slower so that the tweak can calculate the letters you swiped. If you don't, then the word might not come out right. Sometimes drawing curved lines work better than drawing a straight line when the tweak is trying to calculate the letters.